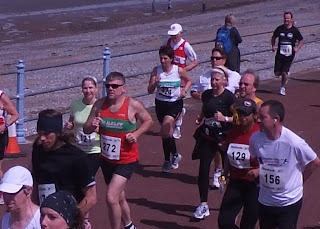 On Sunday the 10th June 2012 I competed in the Morecambe 10K running event. I initially entered this run as part of my Marathon training plan which is broken down into mini-goals. 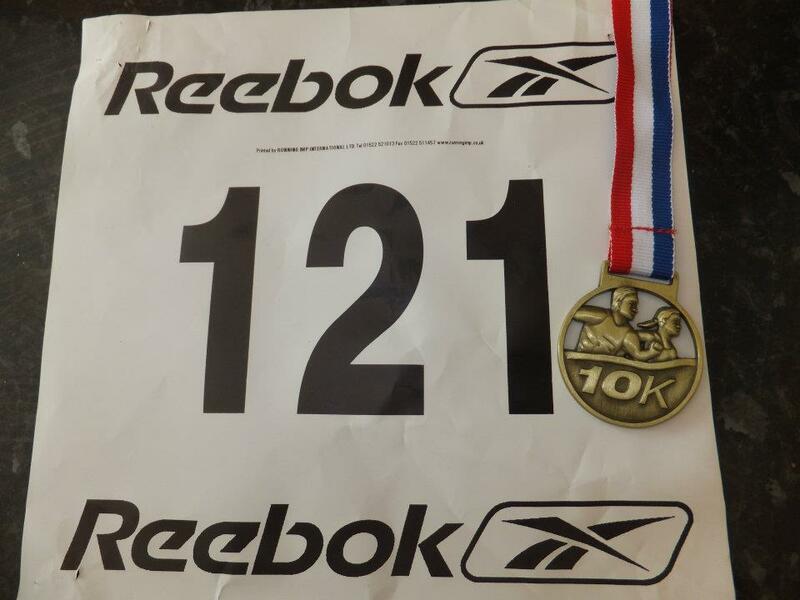 According to the plan the object of weeks 5 to 8 was to increase leg speed and the goal was to achieve a sub 50 minute 10K. I scoured the internet searching for local races that would fall at approximately the right time. 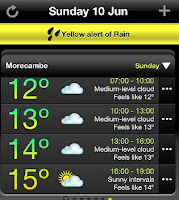 I didn't have a lot of choice but Morecambe seemed ideal – especially since it was described as “a flat route!”. I booked and paid for my place over the internet and was told to collect my race number and timing chip on the morning of the race. This worried me slightly as I had booked through the same race event company I had for the Levens 10K and in that instance they had no details of my booking on race day! 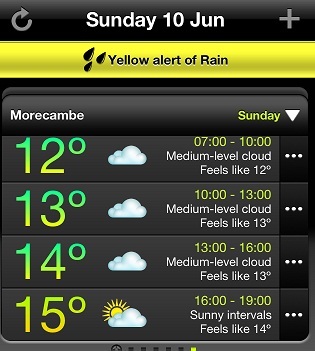 We arrived in Morecambe at around 10am for an 11am start! 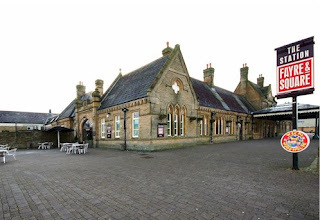 The “race HQ” was situated in the Station pub, so there was somewhere to sit and wait once I had registered. Thankfully this time there was no problems with my booking. I was given my race number and timing chip which came on a band to go around the ankle. I was soon ready to go! 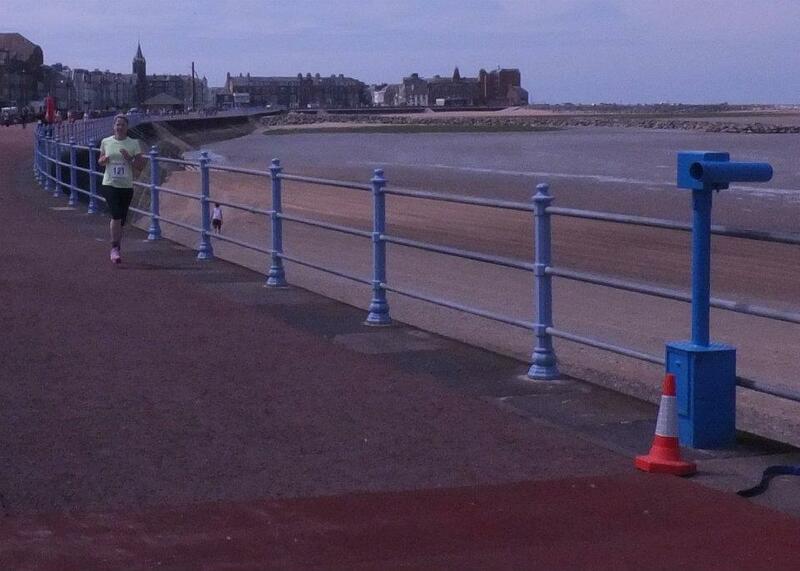 I made my way from the pub across the road to the start line on the promenade. The start wasn’t too crowded and there was lots of encouragement and advice from the organisers. 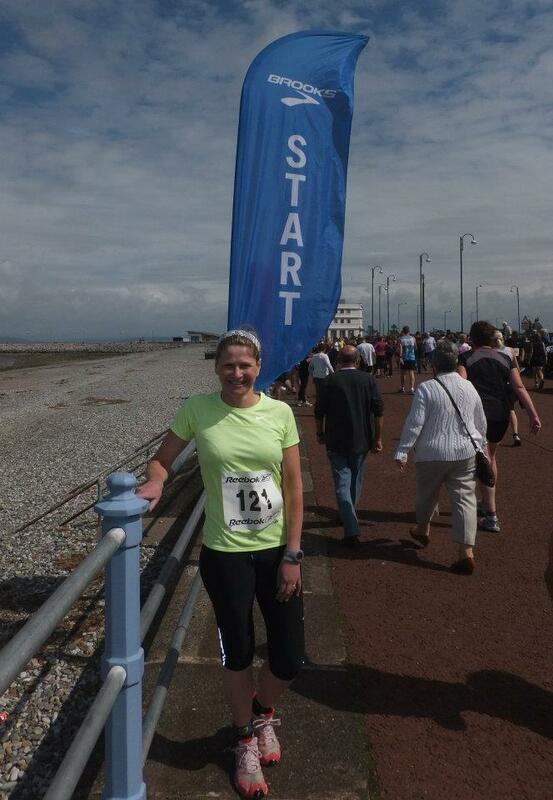 At the start line I saw 2 ladies I had chatted to at previous events – it was nice to see a familiar friendly face! I was determined not to set off too fast (my downfall at my previous two 10K runs) and I had my time splits well and truly embedded in order for me to achieve my desired sub 50 goal! 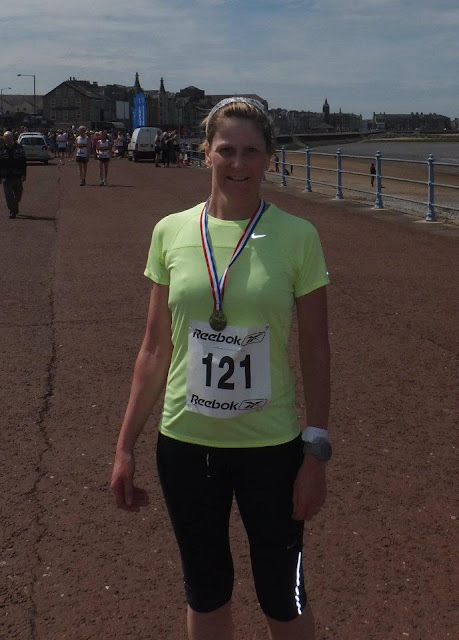 I was a little nervous about going into this race as it was just a small one and I had images of a repeat of Levens when it was mainly elite runners running, however, once at the start I realised it was a nice mix of the elite and the fun runners so I relaxed a little. We were soon off cheered and waved off by a small crowd of spectators. The views over Morecambe Bay on a sunny morning were fabulous as we ran along the promenade. There was quite a strong sea breeze blowing against us, but at the same time it was cooling on such a warm day! I kept my eye firmly on my garmin to ensure I didn’t go too fast and was dead chuffed that for the first 2 miles I was dead on target even with a hill or two thrown in (my definition of a flat race and the organisers definition are obviously very different!). The course went along the promenade and into Heysham before looping back. The first water station was at 2 miles which on a hotday I was grateful for, however what I hadn't bargained on was it being the ONLY one and by 4 miles and with another short hill to climb I was gasping and wishing I had carried my own water bottle. The roads were all open to traffic as it was a small event but there was plenty of marshalls positioned appropriately so that the traffic didn’t cause me any issues. The last mile and a half took us back along the seafront the way we had started, so I knew where I was going and the end was in sight! The seabreeze was still there, but as sods law would have it it was STILL blowing against me – I was expecting to be blown home! The last stretch was a long straight flat finish with sprint potential – glancing at my Garmin I realised I had lost quite a bit of time and tried to push myself for this last part but the legs weren’t willing and I was feeling slightly dehydrated with the heat and lack of water. There wasn’t much encouragement in the way of spectators around the course and I missed this compared with the bigger events. With the finish line in sight I tried one final push and was disappointed when I crossed the line in 54 minutes and 40 seconds, however I cheered up at the sight of a medal! I do love a bit of bling!Once past the finish line I hydrated with some water and bumped into one of the ladies I've seen at previous races. We chatted for a while and soon realised that we live 5 minutes away from each other and so the start of a beautiful running relationship began! We are now firm running buddies! 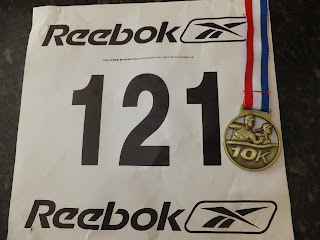 My run number and bling! I now know that i need to do more speed work to achieve a sub 50 10K! The event was friendly and well organised and my only issue was the lack of drinks stations, unless I was so delirious I missed them!